My name is Tim Chesser, interpretations manager at Drayton Hall in Charleston, SC (draytonhall.org). One of our employees has gotten involved in a blood feud with one of our other employees as to whether or not our fireplaces are according to Count Rumford's designs. I am hoping that you can settle this dispute for us. I have attached a photo from one of three modified fireboxes in the house. Video of these rooms is available on our website if you want another view. We know from written records that the boxes were installed in 1803 by Dr. Charles Drayton and that one of the slaves did the work, but we don't have any other information. I'd be grateful of your opinion. Thanks. "Blood feud" eh? I'd hate to be the cause of pain and suffering. The fireplaces at Drayton Hall certainly look like Rumfords and the date is right. Rumford's essays, published in 1796 and 1798, were widely read in this country after Jefferson build Rumfords at Monticello and the James Mease Domestic Encyclopidia, 1802-5 (five vol) included about 30 pages right out of Rumford's first Essay. I would say with some certainty that the fireplaces were "Rumford influenced". It would be interesting to look closely at the throat to see what the shape is and if there are any clues to indicate what the shape might have been in 1803. Fireplaces from this era required a lot of maintenance and, if they were used, they might have been repaired annually and rebuilt every five or ten years. I don't know the history of Drayton Hall but, unless the fireplaces were covered over soon after 1803, it's almost certain that what you see is not exactly what was built in 1803. 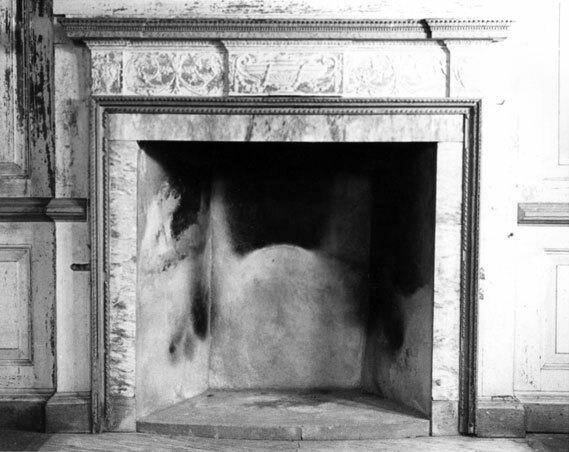 Despite careful scholarship and restoration, the fireplaces at Monticello don't look very much like the drawings Jefferson made of them in 1797. Hopefully I've been vague enough that both of your employees can claim victory. Let me know what you find.